In general, Americans continue to express mixed views of both Muslims and Islam. But on some measures, opinions about Muslims and Islam have become more positive in recent years. More Americans express “warmer” feelings toward Muslims on a thermometer scale than they have in the past, while there has been a decline in the share who say Islam is more likely than other religions to encourage violence among its followers. In addition, most say there is little or no support for extremism among U.S. Muslims. And a large – and growing – majority of the public says that Muslims in the United States face a lot of discrimination, while roughly half of U.S. adults say media coverage of Muslims is unfair. Still, overall opinion on many questions about Muslims remains divided – and deeply fractured along partisan lines. Indeed, Americans – especially Republicans and those who lean toward the GOP – view Muslims far less positively than they view members of most other major religious groups. Half of U.S. adults say Islam is not part of mainstream American society. And the U.S. public is split over whether there is a “natural conflict” between Islam and democracy. In a January 2017 survey, Pew Research Center asked respondents to rate Muslims on a “feeling thermometer” ranging from 0 to 100, where 0 degrees indicates the coldest, most negative feelings and 100 degrees indicates the warmest, most positive feelings. On average, Americans gave Muslims a thermometer rating of 48 degrees, which was 8 degrees warmer than in 2014, when the Center first posed the question. In addition to asking about Muslims, the survey asked respondents to assign feeling thermometer ratings to a variety of other religious groups, and it found that the public has grown warmer toward most religious groups in recent years. It also showed that Muslims, along with atheists, continue to be rated more negatively than a variety of other religious groups, including Jews, Catholics, mainline Protestants, evangelical Christians, Buddhists, Hindus and Mormons. Still, the uptick in positive feelings toward Muslims is notable, especially because other questions in different Pew Research Center surveys also suggest that the public’s view of Muslims has improved in recent years. For example, in December 2016, 49% of Americans said Islam is not more likely than other religions to encourage violence among its followers, while 41% said it is more likely to encourage violence. The share who associate Islam with violence has declined 9 percentage points – from 50% – since September 2014. Views about the link between Islam and violence have fluctuated in the 15 years since Pew Research Center first asked about it. In March of 2002, just six months after the 9/11 terrorist attacks, 51% of Americans said Islam does not encourage violence more than other faiths, while 25% said it does. Responses to this question have become substantially more divided along partisan lines. When it was first asked in 2002, just 11 points separated Republicans and Democrats. By December 2016, the partisan gap had grown to 44 points: 70% of Republicans say Islam is more likely than other religions to encourage violence, compared with 26% of Democrats who say the same. 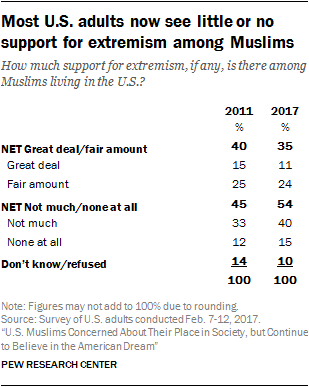 Meanwhile, the share of U.S. adults who think there is little or no support for extremism among U.S. Muslims has increased by 9 points since 2011 (from 45% to 54%). The public was evenly divided on this question in 2011 (with 45% saying that, among Muslims, there was “not too much” support for extremism or “none at all,” while 40% said there was a “great deal” or a “fair amount” of support for extremism). Today, those who believe there is little or no support for extremism in the Muslim American community outnumber those who say there are a substantial number of Muslims who support extremism in the U.S. (54% vs. 35%). Despite these changes in views on Muslims and Islam, there are clear indications that many Americans have reservations about the role of Islam in society. For example, a January 2016 Pew Research Center survey found that one-quarter of U.S. adults (25%) think half or more of Muslims in the U.S. are “anti-American,” while an additional 24% say they think “some” Muslims are anti-American. More recently, an April 2017 poll finds that more Americans say Islam is not a part of “mainstream American society” (50%) than say that it is (43%). And about as many think there is a natural conflict between Islam and democracy (44%) as say there is no such conflict (46%). Republicans and those who lean toward the GOP tend to hold much more negative views about Muslims and Islam than do Democrats and those who lean toward the Democratic Party. For instance, two-thirds of Republicans (68%) say Islam is not part of mainstream American society, while just 37% of Democrats express this view. And Republicans are twice as likely as Democrats to say there is a natural conflict between Islam and democracy (65% vs. 30%). Surveys also show that white evangelical Protestants tend to express more reservations about Muslims and Islam than do those in other religious groups. For example, nearly three-quarters of white evangelicals say there is a natural conflict between Islam and democracy, while roughly half or fewer of those in other major religious groups express this view. Older Americans and those with relatively low levels of educational attainment also tend to be more negative than others in their views about Muslims and Islam, though not necessarily on all five measures analyzed here. Americans who personally know someone who is Muslim (55% of all non-Muslim U.S. adults) express somewhat more positive views of Muslims and Islam than do those who say they do not personally know someone who is Muslim. Many Americans believe Muslims face a number of significant challenges in making their way in American society. 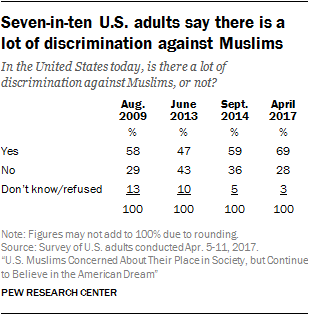 For example, among the public as a whole, roughly seven-in-ten now say there is “a lot” of discrimination against Muslims in the United States. This marks an all-time high since Pew Research Center began asking this question in 2009. Indeed, in the Center’s April 2017 survey (when this question was most recently asked), the share of Americans who say Muslims face a lot of discrimination (69%) exceeded the share who say there is a lot of discrimination against blacks (59%), gays and lesbians (58%), and Hispanics (56%), which has not been the case in years past. As in years past, far fewer Americans say Catholics (17%), evangelical Christians (29%) or Jews (38%) face a lot of discrimination. Recent polling also shows that fully half of U.S. adults think coverage of Islam and Muslims by American news organizations is generally unfair (53%), compared with 39% who think the media is fair to Muslims and Islam. And just one-third of Americans (36%) think that the overall public is generally friendly toward Muslim Americans; 32% say the American people are generally unfriendly toward Muslims, while 29% say the public is neutral.